Bursting onto the international electronics scene in October of 2017 at the Global Sources Mobile Electronics Trade Fair in Hong Kong. If you haven’t heard of that particular tech event don’t worry, neither had we. What really caught our attention though were some rather innovative audio devices from upstart dB Magix Technology. dB Magix is a subsidiary of Shenzhen based electronics giant Foneric. Foneric is a Qualcomm invested enterprise who has partnered with Samsung, Sharp, Texas Instruments and Sony amongst other brands. So, what has Forenic’s dB Magix brought to the table that interests us so much here at Lightningcans.com? Lightning audio tech of course! First, let’s start with the amplifiers, because this is a space (lightning powered amps and DACs) that urgently needs more development. Thus far only FiiO have capitalized on this market with their A1 Lightning DAC/Amp. Underdogs dB Magix are brining the fight to FiiO with not one but two lightning compatible amp/dacs. The AC1 is a 2-in-1 amp and adapter. This means you can charge your iPhone 7,8, X while simultaneously listening to music via a traditional 3.5mm headphone jack. The device is small, compact, comes in three gorgeous colors and has full mic/remote control capabilities. 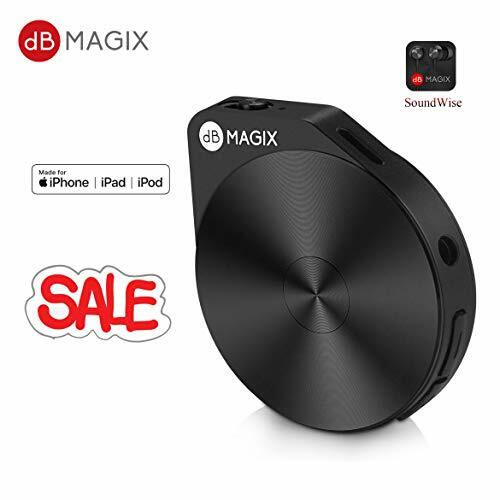 Oh and did we forget to mention all dB Magix devices are Apple MFi certified? This means they all get the seal of approval directly from Apple, so there should be zero issues connecting to your Apple devices. 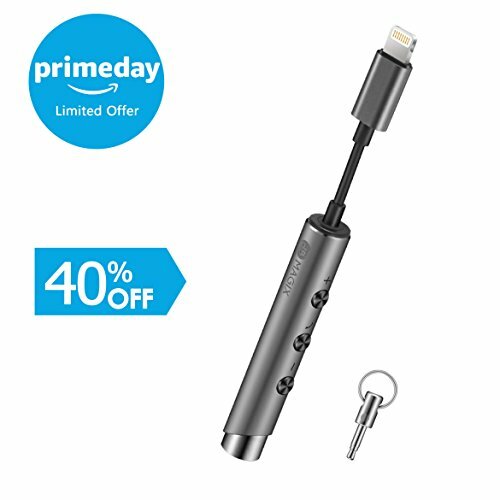 Overall we think this is a very impressive little device and a great solution for anyone looking for something a step above the out-of-the-box dongle Apple ships with their devices. While the AC1 is a better designed, more functional dongle that allows for charging, the AC3 is a beautifully designed dedicated amplifier. With a beautiful matte black color, sleek pen-like form factor and smooth aluminum body, the AC3 truly does impress. The Flute as we like to call it is the perfect solution for someone who has invested considerable amounts in traditional 3.5mm connected earphones and is looking for a way to mate them with their iOS device. The Flute plugs into your Apple device via Lightning connector on one end and your headphones on the other. The body of the Flute has full phone/mic and Siri control. But it is inside the trim little device where things get interesting. The AC3 Flute packs a premium low-power consumption Hi-Fi DAC inside. With the Hi-Fi mode turned on this DAC takes your listening experience to a whole new level previously only achieved with big bulky amp/battery packs. As with all of dB Magix devices, the AC3 is fully Apple certified and thus a strong rival to the FiiO A1. We would LOVE to listen to them back to back and try to choose a favorite! 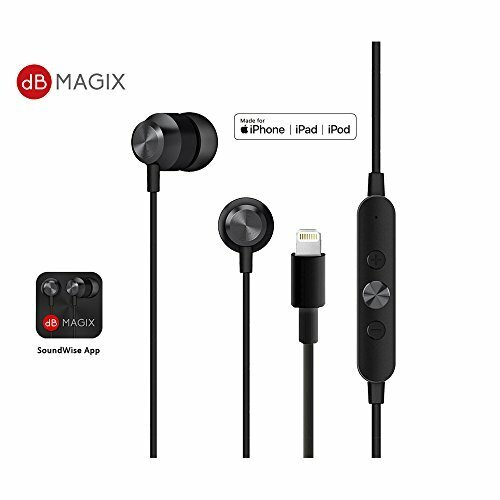 Finally, for those who are looking to make the complete leap away from traditional analog 3.5mm earphones, dB Magix has a pure lightning solution just for you.. The PLX1 are lightning terminated earphones that sit just inside the ear. They are compact, all black in color (which we think is quite handsome looking) and plug directly into your new Apple device, no dongle/adapter required. Built-in Premium Hi-Fi Codec providing incredible digital sound and deep bass, download the "SoundWise" App to active "Hi-Fi Mode"
Containing dynamic drivers (although they don’t say what size) the PLX1s promise high fidelity listening with a deep bass character. They are also super low in energy consumption, so you can enjoy your hifi music for hours and hours. We quite like the look. While other companies are going for a more shouty “look at me” style (we’re talking about you 1More Triple Drivers) the PLX1, much like their name, are quiet and understated, which is something we appreciate. Perfect for commuting, traveling or even the gym (because of their small compact form) the PLX1 are THE dB Magix product to have in our opinion. At first when we saw the press covering the product launches from dB Magix we were skeptical. Here we had a odd name, one we could barely remember how to spell, from a company in China, launching a product at a OEM saturated electronics trade fair in Hong Kong. However, like many things in life, not all is as it initially appeared. dB Magix, under Foneric have the credentials to make you take them seriously. They work with some of the biggest players in the electronics industry (Samsung, Sony etc) and their products are all MFi certified. On top of subtle engineering and styling, there is the quality manufacturing and solid industry reputation to take into account as well. We believe dB Magix future is a bright one. They’ve entered a burgeoning lightning-connected accessories industry and made a statement with products that challenge some very big established players.